The Sounders built depth among a group of midfielders. But much of that midfield depth has battled injuries. And now, the Sounders are shorthanded earlier than expected and must get through these coming weeks any way they can. Part of the offseason construction of this Sounders roster involved knowledge that they would be shorthanded from late May through June because of the upcoming FIFA World Cup. It was a big reason the squad spent $632,000 in Targeted Allocation Money (TAM) on Korean center back Kim Kee-hee. Also, why it built depth among a group of spry, playmaking midfielders. Unfortunately for the Sounders, much of that midfield depth, not to mention Kim, has spent the first three months of the season largely sidelined by injuries. And now, the Sounders are shorthanded a tad earlier than expected and must get through these coming weeks any way they can. Schmetzer last week allowed midfielder Nicolas Lodeiro and center back Roman Torres to leave early to join their respective Uruguay and Panama squads for the World Cup, insisting neither was set to feature in Saturday’s match at CenturyLink Field against Real Salt Lake. Lodeiro still has a fractured toe and Torres a strained hamstring, but despite their injuries being termed “serious” by the Sounders, both players in theory will be getting on a field soon to show their national-team coaches they can play in the tournament. Due to Lodeiro and Torres leaving early, Schmetzer granted the same courtesy to a healthy midfielder Gustav Svensson so he can make the best of a final World Cup roster shot with Sweden. The Sounders could desperately use Svensson this weekend, but he has done so many things to help Schmetzer the past two years that the coach felt he owed his veteran a favor. Where that leaves the Sounders, now 2-5-2 with the second-worst record in Major League Soccer, is trying yet again to get players who remain here back out on the field. The Sounders have spent more money on TAM players since last July than most MLS teams. About $3.79 million of their $11.37 million roster consists of TAM signings Kim, Victor Rodriguez, Torres, Kelvin Leerdam and Magnus Wolff Eikrem. But that quintet of players has logged only 1,528 of a potential 4,050 total minutes had each played the full nine games this season. Designated players Lodeiro, Clint Dempsey and Osvaldo Alonso – earning $5.09 million total – have played just 1,053 of a possible 2,430 minutes. Put it all together, and you have the players earning 78 percent of the team’s payroll appearing in just 40 percent of the action up to now. And virtually no team can be expected to perform consistently under those conditions. Will Bruin worked out on the side Tuesday but remains a longshot to play against Salt Lake because of a partially torn plantar fascia in his foot. Bruin missed the Portland match last week and forced the Sounders to go with Dempsey up top. Dempsey and the rest of the attack looked ineffective. Joining Bruin in sideline training Tuesday was Alonso, who also missed the Portland contest because of a quad strain. Rodriguez continues to work out, but there’s no telling when he’ll play this season due to a tendon problem in his knee. Midfielder Cristian Roldan said the team needed the off week last weekend after a grueling travel schedule and three games in eight days. Schmetzer agreed the break was well-timed, but added that the task ahead isn’t getting easier with some of his best foreign players unavailable until July. He caught a break of sorts with Kim, who was left off Korea’s tournament roster – largely due to his missed playing time thus far – and escaped a nasty head blow in Portland with only a gash and no concussion. Schmetzer also has midfielder Harry Shipp back healthy again and logging some USL minutes with Sounders2 to get game-fit following an ankle injury. 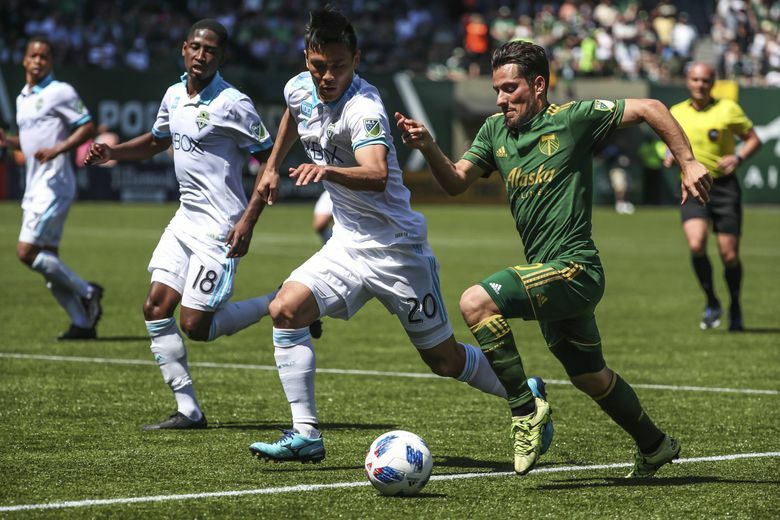 Schmetzer used the bye week to resolve an internal difference of opinion with veteran left back Waylon Francis, who was a last-minute scratch from the Portland trip. Francis issued an apology to teammates last week and Schmetzer said all is good. At least, with Francis it is. Schmetzer now must figure out an attack that’s been blanked six times in nine games.